This year Cinecon will be starting in style with an opening night reception followed by a screening of this classic silent film comedy, starring Buster Keaton in the last movie he made as an independent producer. Making this screening all the more special, it will feature a period score compiled and adapted by composer/conductor Scott Lasky, from original silent era orchestral film cues, and performed live by the Famous Players Orchestra under maestro Lasky’s baton. After the film actor Norman Lloyd with be on hand to talk about his friendship with Buster and about his own long career in acting. 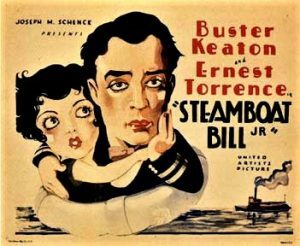 In case you haven’t seen Steamboat Bill, Jr.: Buster is the wimpy son of burly steamboat Captain William Canning (Ernest Torrence) whose business is threatened by J.J. King and his new paddle wheeler. When Junior meets and falls in love with the rival’s daughter, Kitty King, sparks fly. When a hurricane lands in River Junction this film features some of Buster’s famous stunts, including his most well-known stunt when the front of a house collapses around the star. Not to be missed! Tags: buster keaton, Cinecon, Norman Lloyd, Steamboat Bill Jr. This entry was posted on Thursday, August 31st, 2017 at 2:20 am and is filed under Book/Film News, Festivals. You can follow any responses to this entry through the RSS 2.0 feed. You can skip to the end and leave a response. Pinging is currently not allowed.